Invites aren’t reliable and there is no way for your to take those leads and follow-up with them after the event is over. In the past, I’ve used Eventbrite to get people to register and answer a few survey questions. Others online event producers that I know have used Marketo or some other marketing automation tool. You are going to be on camera so make sure the main engagement sources – your voice and perfect smile – are heard and visibile. I’d recommend an external USB mic and for lighting just make sure you aren’t behind a sunny window because your face will be all dark. If you have the ability get some lights shining at your face, to the sides and behind you. No need to buy a bunch but look what you have available in the office/home. And finally, get some headphones for the potential in feedback in your panelists speakers (remember when you called into the radio station, you were so excited that you had the radio still blasted and the DJ asked you to turn it down…use headphones to mitigate this potential problem). When you are doing any live event and streaming video and audio ethernet is highly recommended. Google+ Hangout doesn’t do a good job of streaming with low-bandwidth and alerting you to a bad connection. I was on a Hangout earlier in the year and the host was delayed by over 1 minute and was repeating questions that were already answered by others on the panel – it was painful to watch especially the recording afterwards! When it comes time to the actual Google+ Hangout, invite only those people that you’ve pre-screened. Don’t invite the public or any of your circles! You want to keep the conversation on your Google+ Hangout according to what your agenda is. Sure you might leave room for Q&A from the audience but inviting anyone will result in random people that have untested audio and video appearing within your recording. As always with any online event, give your panelists a call before the Hangout at least 1 to 2 weeks before to go over the questions and double-check their Google+ Hangout settings. 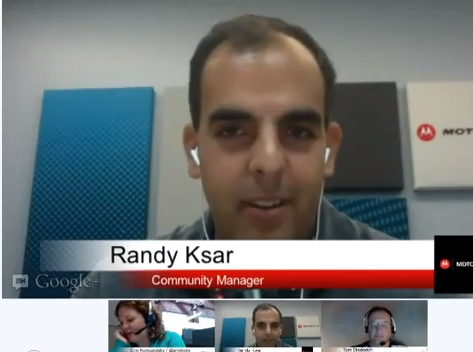 Lots of planning is involved in a Google+ Hangout even though the tool is so easy to use. I’d recommend you send out an email blast to your database at least 2 weeks in advance and depending on your organization and process it might take 4 weeks to come up with copy, graphics, agenda questions, create an event page and internal approvals. I hope these tips help and if you would like to share your best practices on producing a Google+ Hangout or online events in general comment below. Thanks and talk to you soon. Seesmic for updating @teamksar and my fundraising campaign for the Leukemia & Lymphoma Society. Great search functionality and UI is very clean and consise. TV.com for watching the latest NCIS show. Works primarily on WiFi connection so I use it at home while I’m doing the dishes or relaxing outside. and finally Google Listen to catch-up on all the CES-related and NPR podcasts. That’s the top used apps for January 2010. I wonder what February will be. What Android apps did you use most frequently in January? Video Streaming Apps Coming to Android? Are video streaming mobile apps what consumers are looking for? Is there enough market for them? How much would you pay for a video streaming app? What is the business model for video streaming companies? Add based on the web site or is their ads within the mobile app for viewing their content? For more information on the latest Android SDK release here are a few blogs that I recommend you read. If you have any others post a comment below as well. The Weather Channel – I have Cupertino, Pebble Beach (my wedding location), Albany (Oregon), and Papeete (my honeymoon location). Really easy to a city and brings in the most recent weather data as well forecast for the next 36 hours or 10 days. One thing I wish it had was photos from that location – why not pull the most recent Flickr photos with that location? Last.fm: Stream your favorite music over the 3G network. setup is simple and all done via the phone. Up and running within a f ew minutes. Meebo: great web-based IM chat client now on mobile. Login in to multiple chat clients including Yahoo! Messenger, AIM, Gtalk, ICQ, Jabber, MSN, MySpace, and Meebo itself. myAccount by T-Mobile: I can see my current activity, bill summary, and pay directly from my phone – awesome! Now only if the iPhone had this at release then you wouldn’t have seen those 1000 page bills from AT&T. Well those are mine since the past week. What are yours? Post a comment on this post or hit me up on twitter @djksar. One of the best resources on the web I’ve been using recently has been slideshare.net. Everyone is uploading their presentation there from a conference or user group meeting and it turns it into a flash presentation that you can embed into your site (even wordpress.com blogs). Here is one I found titled “What is Android” by Erik Fields from Think Interactive and how it compares to the iPhone SDK in terms of developer platforms and user experience. P.S. My co-worker and I are hosting an Android developer panel this Friday at 2pm PST / 4pm CST on designing, developing, and distributing your Android app. Tune it live to http://blogtalkradio.com/motodev. Questions will be taken online at http://tinyurl.com/motodev, via twitter @motodev and by calling in during the show at (347) 826-9350. Hope to you can tune in. Taking a page out of Apple and their homescreen, Yahoo! announced at Mobile World Congress their new “experience” for iPhone, Blackberry, and other smartphone owners. Instead of Yahoo! being the destination point on your desktop then are now trying to be the portal on your mobile phone. It will include feeds from all your web sites plus data from your social networks in an area that they branded OnePlace. No product was available for download but the dates they have listed on the web site are March thru May 2009 depending on platform(the product managers must be hating that the dates are listed on the site). Also, Opera Mini comes bundled with the app so kudos for Opera for scoring that deal. Will this replace the iPhone home screen? Is it just another app that you still need to click on? Is this Java-based? I assume it is. If my main accounts are on Google will this product be worth it? Sometimes I can’t stand Yahoo! building apps to force me to use their service. They are getting better at openness though so we’ll see. What questions do you have? Make a comment on this blog post. My personal opinion is that this deal is win-win situation for advertisers as well as publishers. Creating a standard, open platform for publishers to choose where their advertising goes is beneficial to the industry. My hope is when I do my ad buys on Google AdWords, I can do placement targeting and choose Yahoo!’s web site as one where I want to place my ads. Otherwise, I would have to have two separate budgets for Google AdWords and Yahoo! Search Marketing. Why not create a platform that is beneficial to the users? Let me know your thoughts by adding a comment to this blog entry.